The Shiller CAPE (cyclically adjusted price-earnings ratio) is typically regarded as a stock market valuation measure. When the CAPE is high stocks are supposed to be expensive, and vice-versa. The CAPE itself is not a good stock market timer. 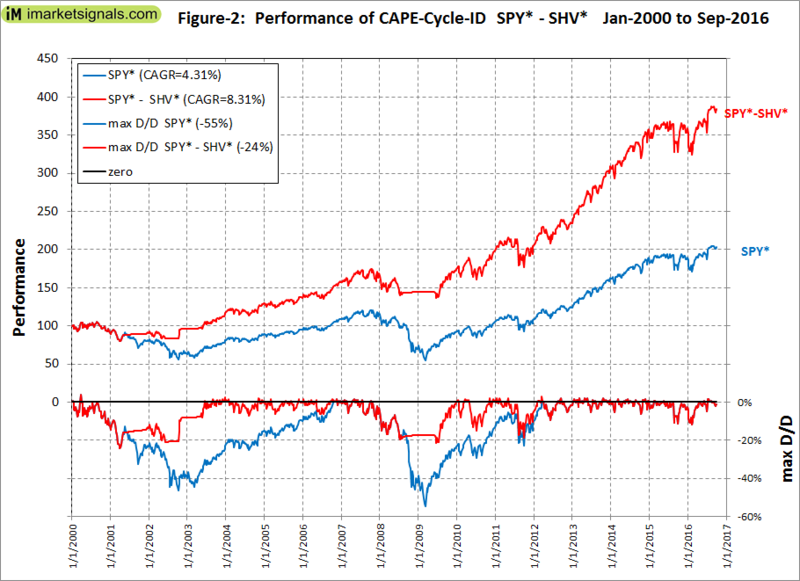 However, the CAPE can indirectly be used for market timing by determining a Cycle-ID as formulated by Theodore Wong. Wong uses double-leveraged long, inverse unleveraged short, and unleveraged long synthetic funds based on the monthly average of the S&P500 from 1900 to 2016, and shows very high hypothetical returns. 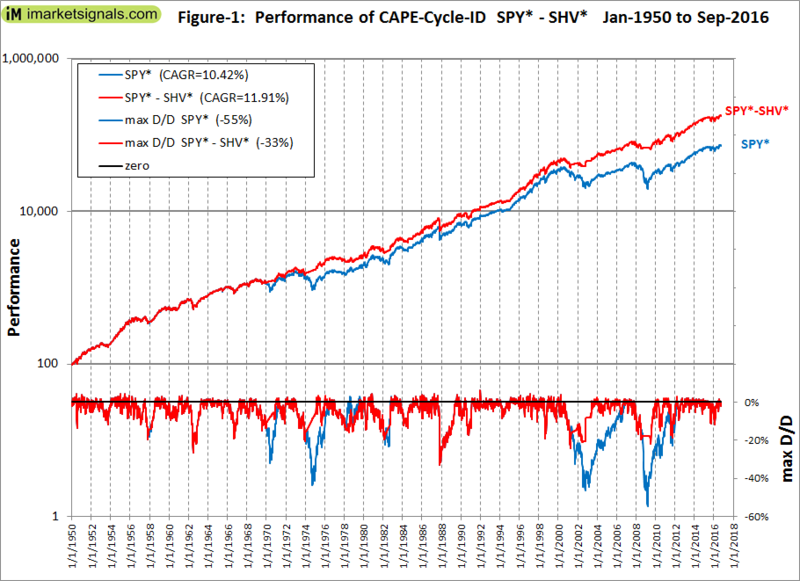 Our 1950-2016 backtest of the CAPE-Cycle-ID model, when switching between the S&P500 with dividends and the money market, showed an annualized return of 11.9%, versus 10.4% for buy-and-hold. The Shiller CAPE can be determined at the end of every month. Inputs are the average value of the S&P500 index for the month, earnings of the S&P500, and the Consumer Price Index. From the CAPE a market timer is developed according to a few simple rules. The construction and rules for our CAPE-Cycle-ID model are summarized below. The rules differ from the Wong model only in respect to the investment choices and trading times. A primary oscillator is constructed from the year-over-year rate-of-change of the CAPE (YoY-ROC-CAPE). The exponential moving average (EMA) of the YoY-ROC-CAPE is then calculated with a smoothing factor of 0.20 (EMA-YoY-ROC-CAPE). A secondary indicator is calculated from the month-over-month change of the EMA-YoY-ROC-CAPE (MoM-EMA-YoY-ROC-CAPE). Score +1 when the EMA-YoY-ROC-CAPE is greater or equal to -13%, otherwise score -1. Score +1 when the MoM-EMA-YoY-ROC-CAPE is greater than zero or when it has a positive slope, i.e. when the current month level is greater than the previous month level, otherwise score -1. Sum the scores for each month. Possible combined scores are +2, 0, and -2. Invest in the stock market when the combined score is +2 or 0. Go to cash or bonds when the combined score is -2. After a combined score change, trade on the first trading day of the following week. We calculated a hypothetical fund SPY* from the performance of the S&P500 with dividends reinvested by splicing the data from the SPDR S&P500 ETF (SPY) from 1993 to 2016, the Vanguard 500 Index Fund (VFINX) from 1980 to 1993, and before that from 1950 to 1980 daily data of the S&P500 with monthly dividends taken from the Shiller CAPE data. We simulated a hypothetical money market fund SHV* with the Federal Funds Rate from 1950 to 2007 and thereafter spliced the iShares Short Treasury Bond ETF (SHV) to it. 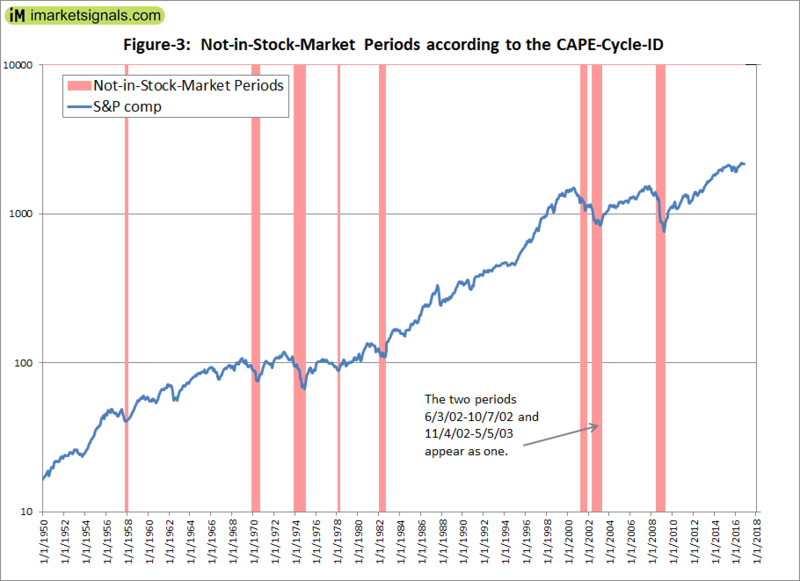 There were only nine periods from 1950 to 2016 when the CAPE-Cycle-ID signaled to be out of the stock market. They are listed below and are also shown by the vertical bars in Figure-3. Higher returns could have been achieved by switching to longer-term bond funds instead of a money-market fund. However, we wanted to show the most conservative performance from this model, which over the period 1950 to 2016 provided 2.5-times the total return of what a constant investment in the stock market would have produced. The model is simple to construct, but can also be followed live at iMarketSignals. Heeding the monthly signals from the CAPE-Cycle-ID should provide insurance against major stock market declines and improve investment performance.